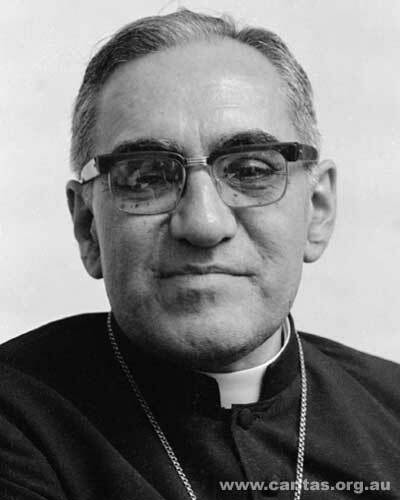 Today marks the 33rd anniversary of the assassination and martyrdom of Archbishop Oscar Romero of El Salvador. Though many of us – inspired by his witness, his conversion, his commitment to justice, and his love for the people – already see him as a saint, there is renewed hope these days that the election of Pope Francis might speed along the canonization process. In celebration of his life and his influence, I offer here four of my favorite quotations, taken from the collection The Violence of Love . in the world it must save. Christ is now in history. Christ is in the womb of the people. the new heavens and the new earth. and the church is all of you. you are a true microphone of God our Lord. “God’s reign is already present on our earth in mystery. That is the hope that inspires Christians. that God demands of us. I’m sorry to hear that. From what I’ve read of Romero, I’d say the preacher had a poor understanding of what Romero meant. Romero believed that we were called to justice and to love, and that we could work towards those ends, but that our own contributions to the Kingdom of God would always be small. He believed that economic and political liberation were necessary goals to pursue, but that the more fundamental liberation was from sin. So it’s not that we can do little in the sense that what we do doesn’t matter, but that we have to see our contributions in their larger context. On this 34th anniversary of the martyrdom of Archbishop Oscar Romero, you might be interested in the music video we have produced to honor his legacy. You may view the video at http://youtu.be/21CN815v2G0. Feel free to post, embed or review the video. For more information go to TheMartyrsProject.com. “I would like to make a special appeal to the men of the army, and specifically to the ranks of the National Guard, the police and the military. Brothers, you come from our own people. You are killing your own brother peasants when any human order to kill must be subordinate to the law of God which says, “Thou shalt not kill.” No soldier is obliged to obey an order contrary to the law of God. No one has to obey an immoral law. It is high time you recovered your consciences and obeyed your consciences rather than a sinful order. The church, the defender of the rights of God, of the law of God, of human dignity, of the person, cannot remain silent before such an abomination. We want the government to face the fact that reforms are valueless if they are to be carried out at the cost of so much blood. In the name of God, in the name of this suffering people whose cries rise to heaven more loudly each day, I implore you, I beg you, I order you in the name of God: stop the repression.” (3/23/1980).